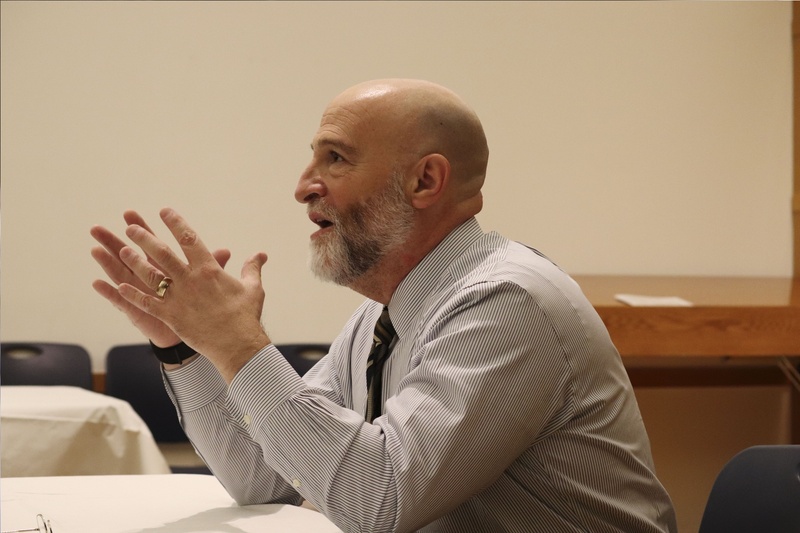 In Wake of Pittsburgh Shooting, Jay Harris Speaks on Anti-Semitism in the U.S.
Jay M. Harris, professor of Jewish studies, spoke with Harvard affiliates about the history of anti-Semitism and the continued effects of prejudice at Harvard Hillel Tuesday night. In the wake of the Pittsburgh synagogue shooting, Jewish studies Professor Jay M. Harris spoke about the history and character of anti-Semitism in the United States at Harvard Hillel Tuesday evening. The Oct. 27 shooting at Tree of Life Synagogue in Pittsburgh, the deadliest anti-Semitic attack in American history, left many on campus grieving for the 11 killed and six wounded. Witnesses said the shooter yelled anti-Semitic statements before he opened fire. 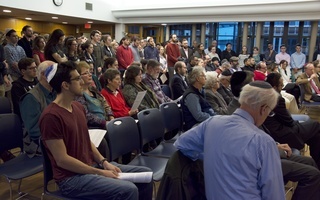 Paulette K. Schuster ’20, who helped organize the Hillel event, said she invited Harris in response to students’ desires for experts to “contextualize” anti-Semitism in America after the “rattling” attack. “It really was a scary reminder that Jews aren’t as integrated as they hoped they are,” she said. Harris’s hour-long talk began with a history of discrimination against Jews in the United States and the origins of the term “anti-Semitism.” He also spoke about the differences between Jews’ experiences in the U.S. and in Europe; though Jews have never been denied citizenship in the U.S. as they have been overseas, Harris said Jews historically faced exclusion from many social institutions in America. After introducing the historical context, Harris went on to discuss what many consider to be burgeoning anti-Semitism among both liberals and conservatives in the U.S.
Corey A. Gold ’19, Hillel’s undergraduate president, said Hillel planned the event for both Jews and non-Jews at Harvard to hear about the reality of anti-Semitism in the U.S. today. “In the past couple years we’ve seen an uptick in the number of anti-Semitic incidents reported, and I think for the first time — for many young American Jews around our age — it’s the first time they’ve really encountered it in such a visceral and painful way,” Gold said. Harris also discussed why he believes anti-Semitism often goes unrecognized as a form of discrimination today. He said that because power is often thought of in terms of money and race and because Jews “track on the powerful side” in both of those factors, it can be difficult to conceptualize anti-Semitism. “Lots of people are not very comfortable acknowledging that you can have... a group of people that are politically powerful — arguably beyond their numbers — and economically powerful — arguably beyond their numbers — who are still vulnerable,” he said. “We need to help people expand the boundaries of how they think,” Harris added. Last night the Harvard-Radcliffe Hillel's coordinating council chose Michael Rosenberg '01 as next year's chair of Hillel and Naamit M.
Our challenge in these moments of crisis is to process the death, anger, and hatred this world hands to us and find a way, still, to respond with deep love.